It feels good to be back in the kitchen! The weather is getting cooler, leaves are falling and our neighbor's tree is full of these beautiful persimmons. 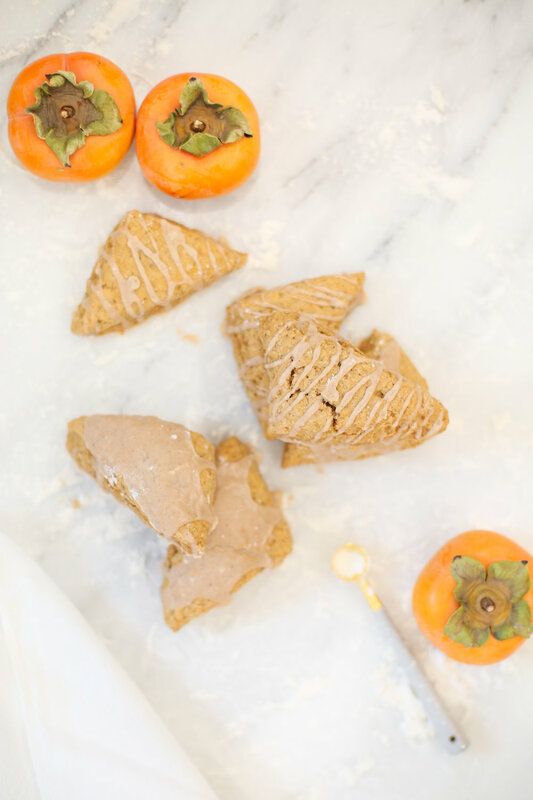 Everything about fall makes us want to bake, and these persimmon scones are some of our favorites. -In a small saucepan, heat ½ cup of water and 3-4 persimmons (cut into cubes) on medium-low heat. -Cover the saucepan, and cook the persimmons for 15 minutes or until fork-tender. -Remove the saucepan from the heat and cool for 5 minutes. -Pour persimmons into a food processor or blender with ¼ cup water, and blend until smooth. -Measure ½ cup of persimmon puree and set aside to cool. Add dry ingredients into a large mixing bowl. Whisk together until combined. Add the cubed butter to the dry ingredients. Using your hands, work the butter into the dry ingredients until you get a sand-like consistency. In a separate small bowl, whisk together the wet ingredients. Pour the wet ingredients into the bowl with the dry ingredients. Mix together with a wooden spoon until a dough forms. Lightly flour your working surface. Knead the dough 5-7 times, until you get a smooth, consistent texture. Shape the dough into a 6” square. Bake 12-14 minutes, until the edges begin to look golden brown. While the scones cool, mix together the ingredients for the glaze. 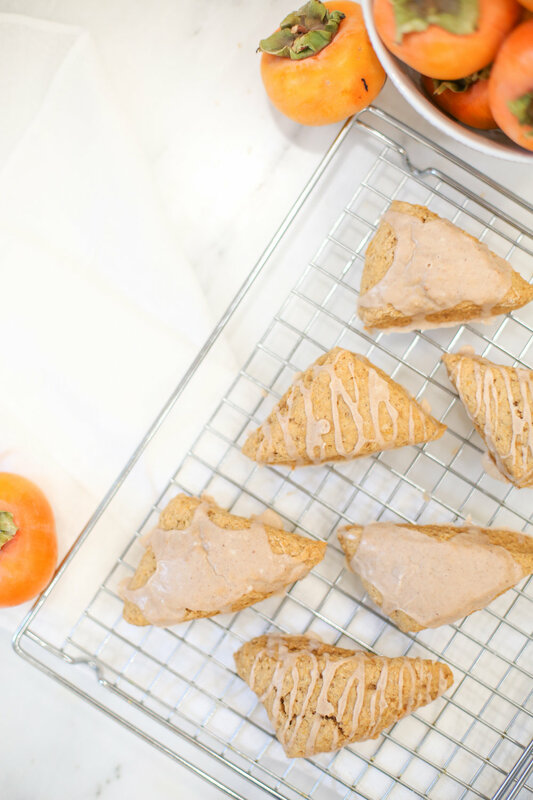 When the scones are completely cool, drizzle the glaze over each scone and allow the glaze to set.